Vocalist Maura Pond, bassist Levi Flack, and guitarist Benjamin Schurr recorded the album as Luna Honey but then later recruited saxophonist Madeline Billhimer to augment the band. As you would imagine, the result gave the minimal wave band a jazzy component, rather like listening to stark loner music but doing so while seated at the edge of a smokey blues club. 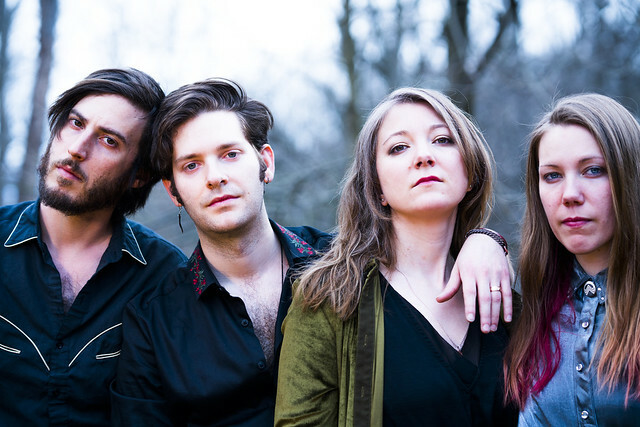 In a review of Luna Honey’s debut album for Washington City Paper, Keith Mathias described the band’s music as dark but not nihilistic. “Overall, Peace Will Grind You Down is a stunningly atmospheric album that does a wonderful job of paying homage to its various influences while finding a fresh approach to their dark and brooding sound. The minimalist compositions occasionally feel a touch too sparse, but that’s likely why the band has recently added Madeline Billhimer on baritone saxophone for live performances and future releases. If this first offering is any indication of what’s to come, we’re all in for a devilish good time,” Keith wrote. See what the buzz is all about and catch Luna Honey at Dew Drop Inn on Feb. 25. Buy your tickets at the door.